Healthy Cranberry Sauce. Usually when I think of cranberry sauce, I think of the high sugar, gelatinous brand that comes in the can. This homemade cranberry sauce is as far from that as it can get. 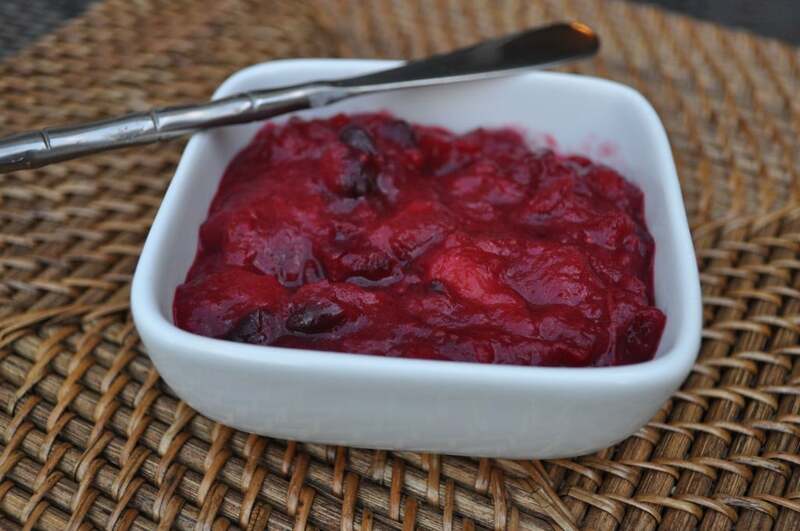 This healthy cranberry sauce recipe contains no refined sugars. I love the tarty and tangy taste and I hope you will too. 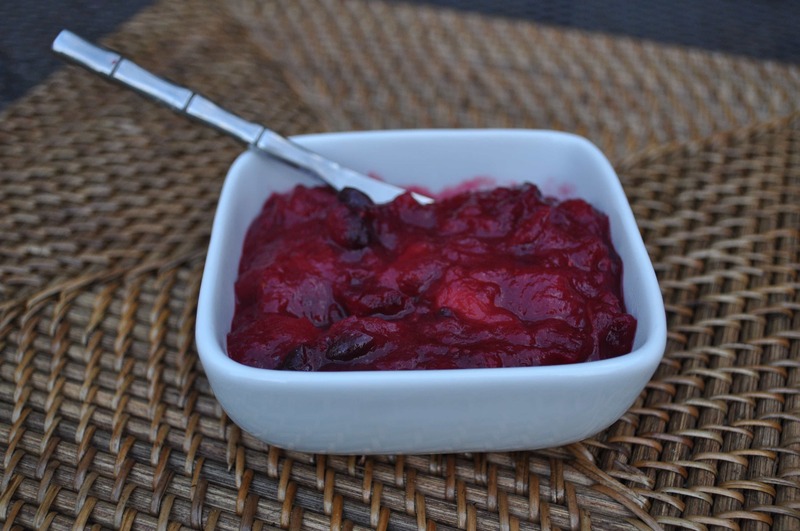 This cranberry sauce recipe contains no processed sugars. It’s also vegan and gluten free. Another great thing about this recipe is that it can be frozen. So you could make a large batch in the winter when cranberries are in season. Then if you get a craving for some cranberry sauce in the summer, you can have it! I hope you enjoy. I used this homemade cranberry sauce as a filling in this muffin recipe too. So delicious! You can also use the leftovers to use in thumbprint cookies. In a magic bullet , blend the pineapple and 1 T pineapple juice until it becomes pureed. In a medium saucepan, heat the orange juice, pureed pineapple mixture, orange zest and maple syrup. Add the cranberries after a few minutes. Remove from heat and transfer to a bowl. The mixture will thicken while it stands. Serve immediately or refrigerate. Enjoy! Refer to the images above to see the process of making them. Glad to get this recipe! I love cranberry sauce, but the one on the back of the package has so much sugar and I end up not making any. Will be making this soon!! What size package of cranberries do you use? I bought organic this year and I think the package is smaller than traditional (8vs. 12 oz). Thanks! I used a bag. I'm not sure the size. Maybe 12oz? This looks great. So even with the pineapple, the pectin develops and the sauce thickens? Thanks! The sauce got to a good thickness for me. Almost like a jelly. If you needed it a little thicker, you can also add some chia seeds. Thanks - good to know. Jelly-like sounds just fine. Chia seeds would not have occurred to me, but I may try them too! They work great in making jams for the refrigerator. I use them all the time. I tasted this when I made it last night, and the berries were still quite sour, so I let it refrigerate overnight. It was better in the morning but still too sour, so I added more sugar, and it's cooking again. I probably added about 1/3 of a cup. Still better than 1 cup! I'm sorry it was too sour for you. I hope the end result turns out okay. Melissa...I have just finished making your healthy cranberry sauce for tomorrow's Thanksgiving meal! I can't wait for it to cool so I can taste it and enjoy it with my turkey. Next, the Paleo pumpkin pie you recommend! And as for the sweet potato casserole, I have discovered I LOVE sweet potatoes baked extra long to bring out the natural sweetness and eat all by itself; no more marshmallows and sugar! THANKS for the jumpstart to a much healthier Thanksgiving meal!! You are so welcome SaraAnne! Happy Thanksgiving! I made this for Thanksgiving. I used a 12oz package of cranberries, and I used fresh pineapple. I added a tiny bit (probably 1/2 tablespoon) of coconut sugar, because it just seemed odd not to add any sugar at all! I know, it probably made no difference other than in my mind. :) In any case, my husband & I both absolutely LOVED this! It was the best cranberry sauce we've had. It jelled up just perfectly and tasted wonderful. Thank you Melissa. That is awesome to hear Jennifer!! So glad you liked it.